Growing up, my brother, sisters, and I amassed an extensive Lego collection. Each of us would get sets for birthdays and Christmas, and together we would build. As we grew older, my sisters and I would delve into other things, and my brother Michael would benefit. Now, all the Legos are his. Even as an adult, he has turned his room into a space station, a boat dock, and anything else imagined. Before his recent departure to boldly go on a two year mission in Oklahoma for the LDS Church, he had spaceships, boats, buildings, structures, monsters, towers of mini-figures, and anything else imaginable covering his desk, dresser, and book cases. At Christmas time, our ceramic Nativity set would have Lego Bionicles protecting Baby Jesus along with the angels. Our Christmas tree would have various Lego creations helping decorate it. For the rest of the year, various Lego decorations would appear randomly on the wall unit and book cases. The Lego Minifigures of Original Star Trek characters my brother added to the Star Trek version of Clue I made him for Christmas one year. In other words, the Lego Movie is a look inside my brother’s head. What I did not expect while watching it was to find a reflection of myself. Wait… but I thought the whole movie was animated! Post-Modernism both questions what is real, true, and absolute, as well as playing with inter-textuality. 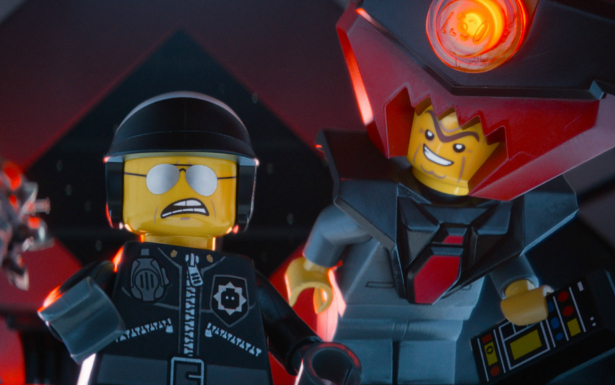 If the Lego Movie isn’t Post-Modern, I don’t know what is. Story A of the Lego movie is set in an animated world and is the heroic journey of regular-guy Emmett and his quest to stop Lord Business from destroying the world with his super weapon: The Kragle. For thoughts on the real world dangers of using the Kragle on Legos, click on the picture above. Story B is set in ‘reality’ with a boy attempting to play with his dad’s Legos, while his dad wants to maintain complete and absolute order, not giving in to the creativity that Legos can unleash. In many ways, The Lego Movie is The Matrix, with Emmet replacing Neo, the boy and Vitruvius combined to be Morpheus, Wildstyle as Trinity, and Lord Business as Agent Smith/The AI. There are layers of reality, and only the main hero is able to see both completely. Also, there are robots. Built within this multiple-layered-reality are iconic figures like Batman, Star Wars characters, as well as eclectic combinations such as Unikitty. And with all of these complicated layers, at their core, both stories are great and have heart. We as an audience become invested in Emmett’s journey and in the son-father bonding story. We care about the characters, and what is at stake. We care about the ability of Master Builders, both mini figures and human, to be creative and use Legos to their maximum potential. What could easily be an idiotic, obnoxious character, is redeemed by a layer of innocence and wonder brought by Chris Pratt’s voice acting. Emmet is an Everyman, a character who represents all, and his specialness is in his non-specialness. It is through his perspective that we are swept through the fantastic landscapes of Lego City, and the wild west, and more. The animation, though CG, feels lovingly hand-crafted. It is purposely a little choppy in parts, and every Lego piece both actually exists, and is portrayed as accurately as possible. There is a lot of craft to enjoy in this film, especially when characters are building things on the fly. The authoritarianness of this movie is both well-done and hilarious. Everyone has instructions of their daily routine, listens to the same song all day, and watches the same show (Where Are My Pants?, which could be a huge hit starring Ashton Kutcher). Lord Business is a magnificent evil tyrant, and his henchmen robots and police officer are great. There is just enough menace and sameness to build a formidable and dangerous enemy. A hero cannot be great unless there is a great villain. Batman is a vain, though handsome and formidable teammate. Wildstyle is both love interest and guides Emmet into the larger world. Vitruvius, as played by Morgan Freeman, is a just-quirky-enough wise guide, without overdoing his role at Emmet’s side (this rhymes, so it must be true). 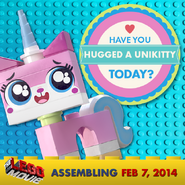 Unikitty is strange, adorable, and apparently great at disguises. Benny The Spaceguy loves SPACESHIPS! (More on this later). And plays this to its maximum potential. Example: Metal Beard. He has a shark on his arm, and why not? Throughout the movie, this couch is derided by other characters and seen as Emmet’s lack of creativity. However… umm… Who doesn’t want a double-decker couch? This thing, once again, is amazing. 2. This movie is SPASTIC! All of the candy-colored ridiculousness is fun, but can be a bit exhausting. Either this is a sign I was tired when watching it, or I’m trying to stretch to find legitimate criticism of the film. 1. Another Lego Movie! Which will probably involve Duplos. 2. More movies about children’s toys. Hopefully they will be as intelligent as this film. Good job, Phil Lord and Christopher Miller. Let’s see what giggly, spastic adventure you can launch next. As I mentioned at the beginning, I did not expect to find myself in the film. After my brother and his girlfriend saw the movie, they decided everyone had their Spirit Lego. My brother’s is Lego Batman, his girlfriend’s is Unikitty, my youngest sister is Wild Style. They told me which one was mine, but I was hesitant. My brother and his girlfriend, AKA Batman and Unikitty. Once I saw the movie, I realized this was true (even though it doesn’t rhyme). Throughout the film, Benny randomly shouts, “Spaceship!” and begins building a spaceship… because spaceships are cool. He’s a bit spastic, always optimistic, random, and loves spaceships. 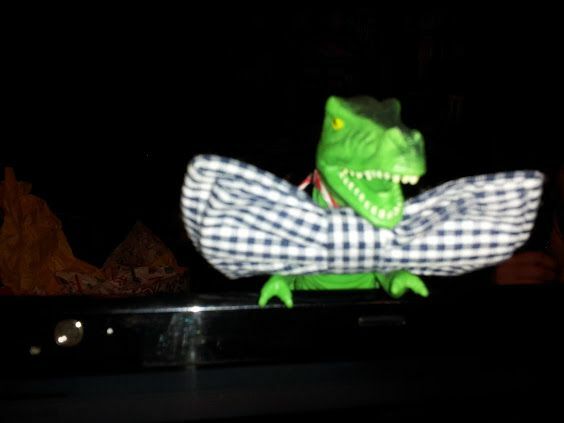 As long time readers of the blog have figured out, I can be a bit random. I’m not very spastic, though, except when I get excited by things like spaceships. Star Trek: Into Darkness won my 2nd Annual WIT awards because… SPACESHIPS! My favorite part of Thor: The Dark World was… the bad guy’s spaceships. 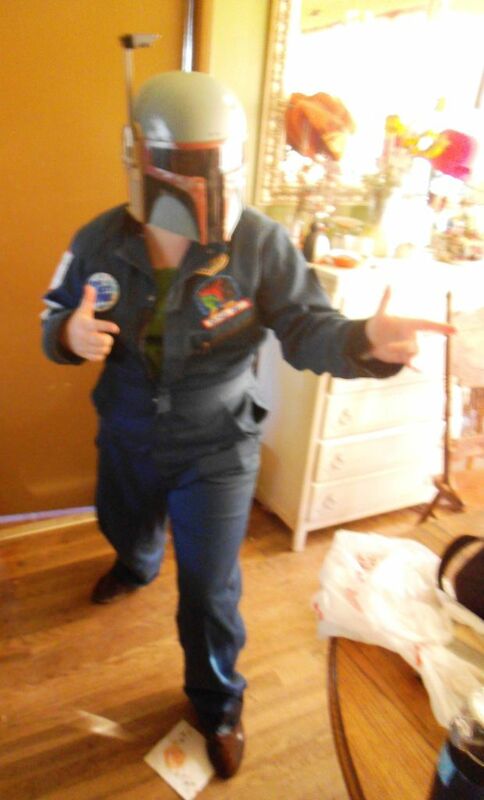 Boba Fett is my favorite character from Star Wars because he has a space helmet, and a spaceship. My car is the Spaceship Spork, and I made a matching outfit for Halloween. How did you celebrate May the Fourth? I loved The Lego Movie. It felt, to me, like an extended analogy for independent artists, writers, filmmakers, musicians, etc., etc. I don’t simply mix genres, I puree them, deliberately blurring the lines between horror, science fiction, and fantasy with malice aforethought. And I have had a great deal of resistance from the “official” gatekeepers, who want to tell me that I don’t belong in any of the “official” worlds–I’m not science fiction because I don’t have rocketships, I’m not horror because I don’t have zombies, I’m not fantasy because I don’t have dragons, and I’m certainly not literary fiction because I do have things that don’t exist in the real world. I’m probably Unikittie–I build my worlds out of all the leftover pieces, a little bit of this, a little bit of that, and a great deal of contempt for the way that things are supposed to be done. I love that modern pop culture is more accepting of hybrid genres, and looking for them. It’s a great way to use the familiar and make something fresh and exciting. I’m holding off on seeing it so there will be something new for me when I take my daughter to the Harkins Summer Pass movies this summer. 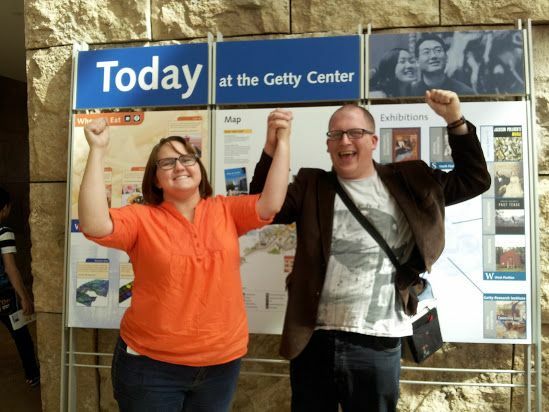 I wanted to squee a moment about your mention of creating a Star Trek themed Clue game. My best friend and I did this as well, only ours was TNG themed. It makes Clue a lot more fun. For example, Was it Kirk with the Tribble in the Transporter Room? I actually don’t remember who died. I think it was a generic red shirt, but the game was planned by a god-like being to prove the mettle of the Enterprise crew. It’s definitely very, very good – for all the reasons above. You’re right about it being exhausting, though. It’s breakneck-paced and Schizophrenic in execution. I think it’s fantastic, and would happily sing its praises, but I can imagine parents hating it on their kids’ twelfth viewing. If I were a parent, I think I would rather have my kids watch the Lego Movie twelve times than a lot of other films and tv shows. Also, it might be a good break for parents from their kids watching Frozen. Really thorough analysis of the Lego movie. Totally agree about the brightness and intensity but have to say it made a welcome change from the darker, more subdued palette used by the majority of superhero movies recently. Also wanted to say thanks for the refer link to ‘The Kragle Kills Dreams’ nice to know people are reading my stuff 🙂 What’s your take, do you think parents ever have a good reason to glue their kids’ Lego together? 1. The only time Legos should be super-glued is when someone is doing ginormous installation projects, like a life-sized Darth Vader, or a giraffe. 2. The upbeat nature of the film was a really nice break from darker fare. 3. I’m always happy to give a shout out to the work of other bloggers. I adored this movie, but disagree with your glowing assessment of the double-decker couch. Lord Business, a character who was so wrong about so much, was right to pick apart its many failings as a piece of furniture. But the joke that made me laugh for days was when Bad Cop’s dad would. Just. Not. Stand. Still. 1. It would be handy in my house, where my family of nine people oplus significant others and other friends often congregates – more space for people. 2. 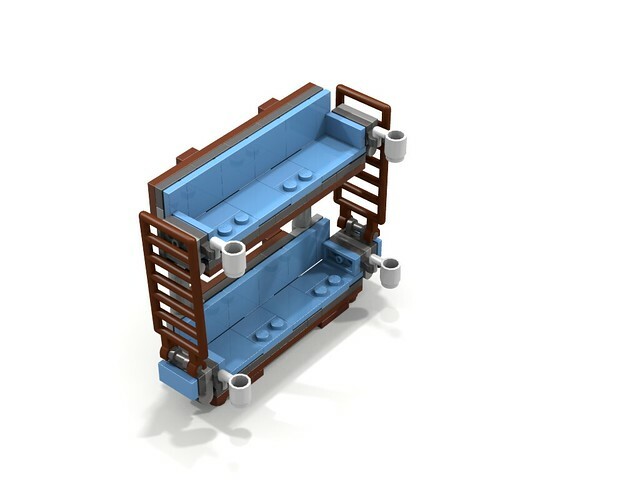 It’s basically the same as a bunk bed, which means it’s not that far off the ground. The person in the top middle could just jump down. 3. To counteract people’s legs hanging in other people’s views, I would sit short people on top and tall people on the bottom. 4. It has extra storage, which would come in handy. 6. It could be used to make awesome blanket forts. However, couch-stadium-style seating might be a little bit better. I loved the movie. My sister was really angry that it switched to RL at the end and thought it made it like “every other movie out there” and she wanted it to stay all lego. That was her criticism. I didn’t care and just had a lot of fun! I actually thought the switch to live action is what makes the Lego Movie different than others, and gives it layers. Yes, it would be fun to have the whole movie in Legos, but there wouldn’t be as much substance. Also, it was better handled than the jarring switch in Happy Feet from ‘a movie about cute singing penguins’ to a live action hybrid PSA on environmentalism. LOL I never saw Happy Feet. That sounds really interesting actually. I’m going to try to find a youtube clip. Oh, and I’m probably Emmett, unfortunately. What’s unfortunate about being Emmett? He’s hopeful, fun, and ends up being able to save the day. Also, he gets Batman’s girl. That’s pretty impressive. That’s one way of looking at it. I was thinking more about how Emmett just does everything by the book and doesn’t really like to stray outside of the instructions. That can be useful too. I really loved watching The Lego Movie at the theater. It was the perfect spring flick and it was hilarious to boot! I had a hard time with the animation at first. Like you said, it’s choppy at times, but after several minutes deciding it wasn’t actually bad, I loved the whole adventure. The kicker were the wisecracks. I mean, whoever wrote the screenplay did a phenomenal job with it and I wouldn’t mind watching a sequel, if it ever came out!